NEWS(英語) | Sawada Co., Ltd.
At the beginning of March, we are going to exhibit SAWADA YARNS at SPINEXPO Shanghai. 5-6 March 9 a.m. – 6 p.m.
7 March 9 a.m. – 4 p.m. 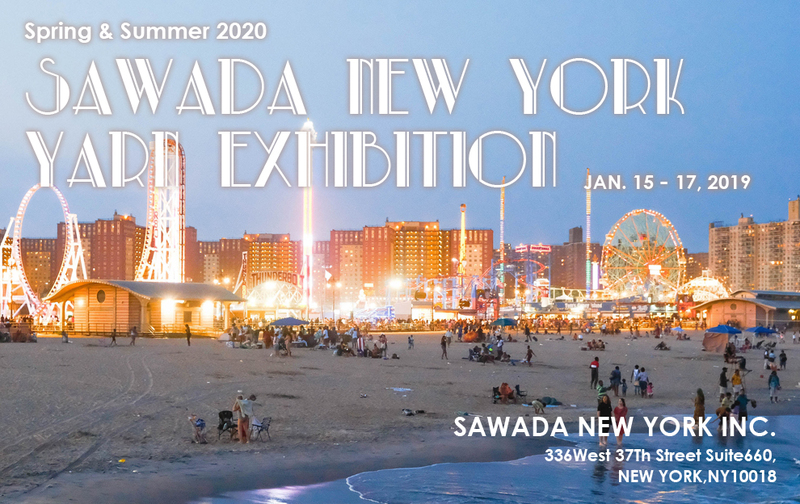 In January, the SAWADA yarn exhibition for spring and summer 2020 will be held in New York. Please save the date & the venue below! Venue name: SAWADA NEW YORK INC.
We are going to exhibit SAWADA YARNS at SPINEXPO Shanghai in the beginning of September. 4-5 September 2018 9 a.m. – 6 p.m.
6 September 2018 9 a.m. – 4 p.m. 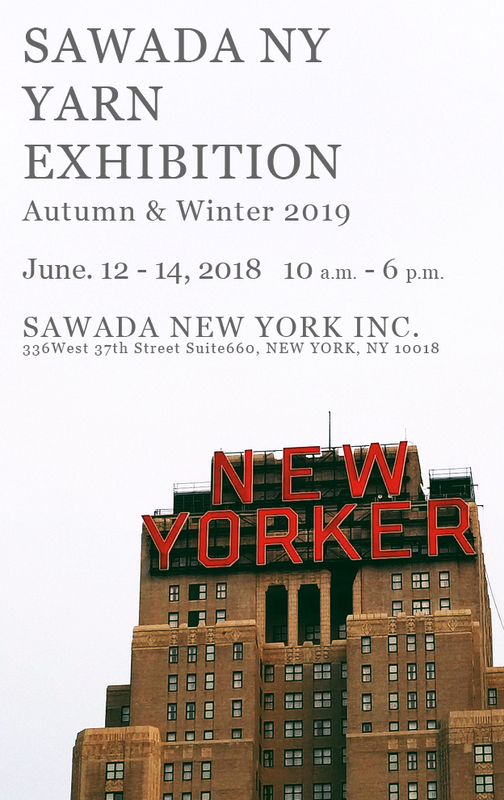 In June, the SAWADA yarn exhibition for autumn and winter 2019 will be held in New York. In the middle of March, we are going to exhibit SAWADA YARNS at SPINEXPO Shanghai. 13-14 March 2018 9 a.m. – 6 p.m.
15 March 2018 9 a.m. – 4 p.m. In February, we are going to exhibit SAWADA YARNS at SPINEXPO PARIS. 6 February 2018 9 a.m. – 6 p.m.
7 February 2018 9 a.m. – 4 p.m. 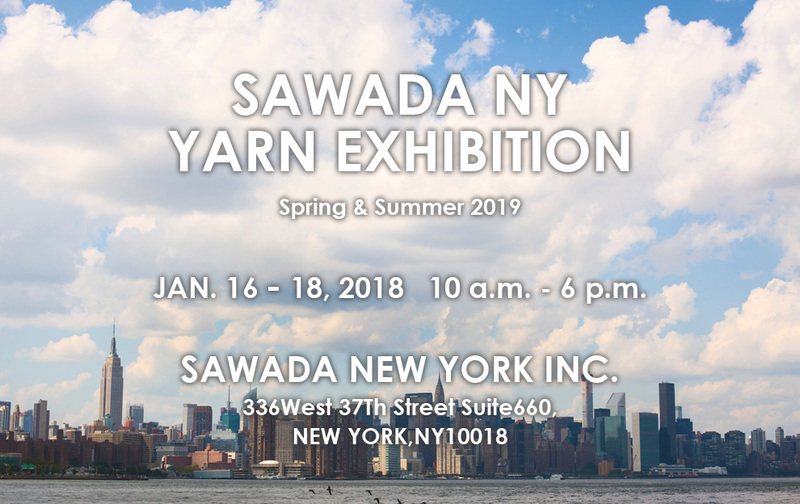 In January, the SAWADA yarn exhibition for spring and summer 2019 will be held in New York.